Small yards are easier to maintain and less expensive to build than big yards. They are not easier to design however. My early design years were spent working in an urban area filled with “postage stamp” size yards. The first small yard I designed was 14 feet deep by 20 feet wide. I thought this is going to be a breeze, right? Wrong! 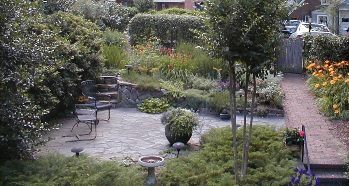 It’s hard to make a complete landscape that looks great and fulfills a client’s expectations in a small space. Luckily, I pulled it off after working on the design for about 10-12 hours. The magic that was created there was that a totally blank rectangle of grass that nobody wanted to use was transformed into a space that appeared large and welcoming. The client was amazed at how much larger the space appeared once an organic shaped brick walk and patio were added surrounded by a variety of plants. This phenomenon works because people can now participate in the space. There is a reason to go there. This patio was carved into the hill between the house and the back alley. A place that you could spend hours reading a book or enjoy having drinks with a friend has been created. Step through the wall and behind the shrubs to a private garden of vegetables and flowers. There is no room for error. In small yards, you see the entire space at once and something out of place is easily noticed. A plant that is wrong for the location or paving that is out of proportion or the wrong color shows more quickly in a small yard. This small yard is larger than a postage stamp, but not by much. 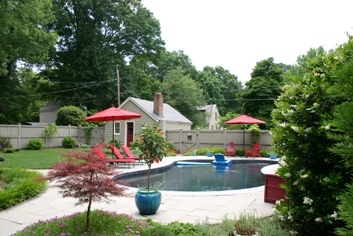 Incorporating a swimming pool into a small space can be difficult. Distances from the house and property lines (set backs) established by building codes add restrictions on where it can be located. From a designer’s perspective, it needs to be in a location that allows easy and safe movement around it. It shouldn’t be on top of the house, so that you have to go around it every time you venture outside. Notice how the fence is stained to blend with the outbuilding. The black surface of the pool is especially striking making it a dramatic focal point as well as a fun entertainment area. Consider how it is going to be used and list the things you want to have in it. Prioritize because the space may not allow everything, but there may be a creative way to incorporate the things you want without taking up too much space. For example, I never had play equipment in our yard for my children because of space limitations. It would have been a hideous focal point for my small back yard. What I did have however is a swing in the big shade tree. Not only does it look charming, but my kids and their friends would play on it for hours. It has a black rope which makes it even more subtle. For small urban gardens, I usually don’t use any lawn. Landscaping can be full and colorful in this situation without it. Lawn areas are just too small to be impressive and such a nuisance to maintain. In Central Virginia, we struggle to keep lawn healthy in the summer. Our heat is hard on it, so I think a small urban space is actually much more attractive without it. Alternatively, replacing your small lawn with artificial turf not only reduces upkeep costs, but keeps your lawn looking fresh and green year round. Choose paving materials wisely. The paved surfaces may encompass a good portion of the area and you’re going to be looking at it a lot. Colors need to accent and blend with the house. Surfaces should be level to accommodate outdoor furniture (no wobbling tables and chairs please) and be safe to walk on. Fences and screen plantings need to be in proportion to the space. There are usually code restrictions on fence and wall heights, but they are not always followed. Sometimes people want privacy so badly they are willing to build a fortress to have it. A small space can be quickly dominated by a fence or wall that towers over it. A good solution is to keep the structure to a height of no more than 6 feet, 6 inches and plant large shrubs that will get taller behind it. If installing plants for screening take into account the width of the plant at maturity. A plant can quickly push into a space and take it over. Use decorative objects and garden ornaments where appropriate. Small gardens are a natural place for them. Again I think because you see the entire garden at a glance it makes these objects more noticeable. Walls are a natural place for a wall fountain. Decorative gates to the back alley are viewed from the house. Some small gardens shine with a fountain that’s a central focal point. The pond and waterfall took the place of a solitary tree that had taken over this small yard. This beautiful back porch is a great place to entertain guests. Nobody would use the yard, however. As mentioned earlier, there was nothing drawing them into the space. The pond solved the problem. It is intriguing and people can walk right up to its edge. Water plants add another dimension of color and texture. There are benches around the edge that unfortunately are out of view in this photograph. They give the visitor a place to spend time and relax. The landscaping adds a wonderful view from the porch as well as the rooms on the second story. This small entry way developed off a new addition. The homeowner wanted to be able to get in and out of the car without the dog being able to escape from the yard. 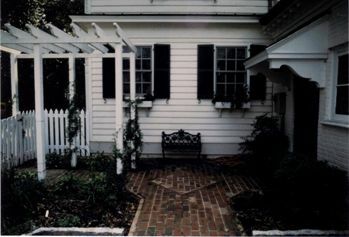 The white picket fence adds charm to the landscape, creates a defined entrance for the house and keeps the dog secure. The black wrought iron bench gives a focal point when you are looking at the house and gives a place to set things on if you need two hands to open the back door. The brick walk has a diamond pattern in the center of the crossroads for an added detail. The pergola was inspired by the pretty old existing cover on the back door. I kept the pergola the same height as the door cover and repeated some of the architectural detail. 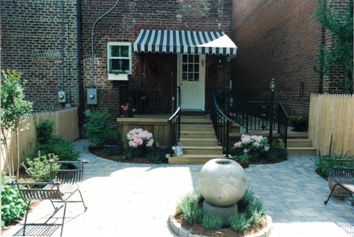 Water sheets over the sphere in the center of this small yard making an effective focal point. The deck was redesigned to have the steps line up with the back door. An updated black powder coated aluminum railing gives the deck a completely new appearance. Notice that the skirt around the deck finishes it off nicely so you don’t see the underside of it. A yard of grass and weeds was replaced with concrete pavers and plantings that create a courtyard style garden that is very easy to use. Small yards can be cleaned up and mulched in a flash. It doesn’t take too much water and fertilizer to keep them alive. You can use more expensive materials because there is not as much space to landscape. Whatever size that area is behind your small house, it has potential. Without much expense you can turn it into another wonderful living space for your home. Questions about your small yard? They are challenging!I would like to help! Ask me a questions about any landscape design issue or concern. You will get a quick response and a page dedicated to the topic on this site. You can share it with your friends and the readers will appreciate it too. I hope to be hearing from you! 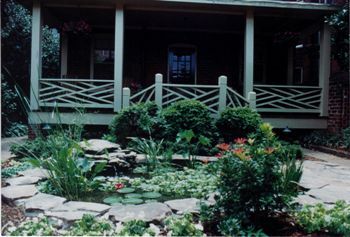 Related Pages: Landscape Design Pictures; Cottage Gardens; Patios; Fences and Garden Walls.